Karen Meat and the Computer at O’Leaver’s Jan. 30, 2016. It was a great weekend of live music, something I haven’t been able to say for a number of weeks. It started Friday night at O’Leaver’s with a triple bill kicked off by Django Greenblatt-Seay’s band Gramps. Third time’s a charm for these boys, as the set was their best yet. I’ve described them in the past as a sort of slacker-rock cross between Little Brazil and Criteria, which leaves out the lyrical uniqueness that G-S brings to the table. His songs are field observations about a guy doing his own thing whilst living in the shadow of a corporate-fueled existence — which has a familiar resonance to Criteria’s anthems, though G-S’s life is quite different than Steve Pedersen’s. I watched the set seated at a table filled with co-workers who also are G-S’s co-workers. Imagine playing your music in front of the same folks you see every day down at the office. I’d be nervous. For G-S, it was just another day at the office, albeit a much different office than the cubicles we all share downtown. Gramps was followed by Des Moines’ Karen Meat and the Computer. With two guitarists and a bass player, they’re not your run-of-the-mill power trio. Drums came by way of prerecorded tracks, and for the most part I didn’t miss them (though the “stage” looked a bit empty). I take that back— while the rhythm lines were predictably tight, the energy level was a tad lacking. Front woman Karen Meat a.k.a. Arin Eaton, filled the void with her girlish growl on golden garage-rock tunes that got me singing along by the third time through the chorus. Check out the recordings. They had a cassette for sale at the show but didn’t get a chance to pick one up. Man, a lot of bands are putting out cassettes these days. I guess they provide the same nostalgia for half the price of vinyl. Sam Martin at O’Leaver’s Jan. 29, 2016. 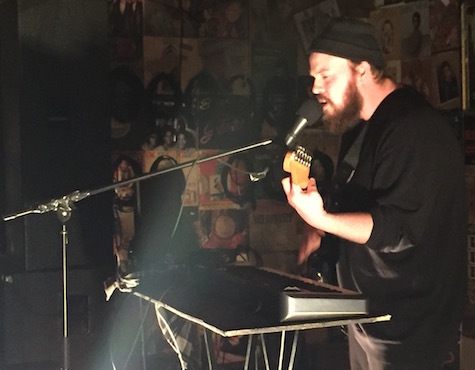 Finally, the all-new all-digital version of Sam Martin closed out the night with a set of throbbing electronic rock songs that are his catchiest tunes ever. The set-up was Sam behind a synth rack, guitar slung over his shoulders, and a pair of strobing flood lights at his feet that bounced along with the digital pulse. Maybe it was the fact that he was singing to layers of prerecorded tracks but Martin’s voice was at its most controlled, least caterwauling. Sonically, music ranged from deep-blue house beats to acidic front-loaded rhythms, each song glowing with its own energy. I look forward to hearing Sam’s next record. So is Martin’s one-man show the future of indie rock? Sure, there have been a lot of one-person projects over the years (Darren Keen was among the first to do it locally), but I keep seeing more and more popping up. Is it the product of technology or the reality of today’s music economics? Regardless, the trick to making it work is finding a way to make the performance lively despite the isolation. Martin pulled it off with the combination of lights, beats, guitar, voice and a giant helping of Martin charisma. High Up at Take Cover Five at O’Leaver’s Jan. 30, 2016. 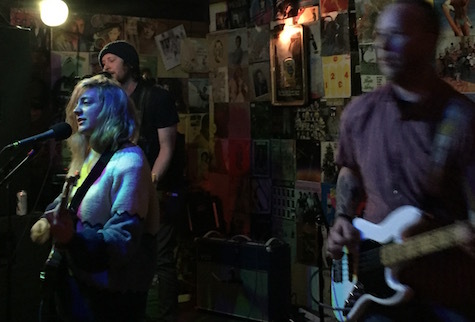 Onto Saturday night and Hear Nebraska’s fifth annual Take Cover show at O’Leaver’s. As expected, it was a crushed room cast in constant motion — 12 bands, each performing one cover and one original. The cover had to be a song by a fellow Nebraska band. I’ve been to most of the past Take Cover nights and usually left wondering what was the point, as they featured unknown bands playing covers of unknown songs by fellow unknown bands (that would have been the case had I gone to the Lincoln version of Take Cover last week). Saturday night’s show was the best Take Cover yet because it featured full bands (Take Cover used to be a solo acoustic deal) covering familiar songs, or at least I knew most of the bands and songs they were covering. A standout was old school punk band Hand Painted Police Car covering The Faint’s “Agenda Suicide,” giving the classic electro-clash rocker a new metal life. The guitars and bass ripped into the main melodies, while guest synth player Dereck Higgins provided the familiar digital icing on the cake. Then the band flew into one of their own numbers without letting off the gas and voila, you’ve just discovered a new band that you hadn’t heard before. And that’s the point of Take Cover — it’s an annual tribute to past conquests by the next wave of conquerors. You (hopefully) leave the club with some new bands to follow. Among the new blood that caught my ear was Marcey Yates. I’m not a hip-hop guy but I can spot the real deal when I hear it and this guy is about as legit as it gets. And he did it live. Then there’s Vegetable Deluxe, a garage band fronted by former Brimstone Howl member Nick Waggoner, the guy who used to look like he was 14 years old and now looks exactly like Beck. Forget how he looks. The band captures that ’60s East Coast psychedelic sound circa Lou Reed / Velvet Underground about as well you’re going to find ’round these parts. Someone should have slotted them to open that Brian Jonestown Massacre show in May. I’ve been trying to catch a set by Eric In Outerspace for a long time and now I’m kicking myself for having waited so long. They do a sort of psychedelic garage rock thing as well, though it’s marked with a ’90s post-punk Sonic Youth flair. Which made them perfect for covering Noah’s Ark Was a Spaceship. Uh Oh at Take Cover Five at O’Leaver’s Jan. 30, 2016. Earlier in the evening Uh Oh, another band I’ve been trying to catch for a long while, crushed an Eric in Outspace cover before ripping into their own song. Look at all these new bands taking over the scene. Maybe the most compelling covers of the night were of Digital Leather songs. Mint Wad Willy did a straight up rock rendition of DL’s “Young Doctors in Love” that added heavy guitars on an already heavy song, and Omaha’s hottest new band High Up tackled DL’s perennial set closer “Studs in Love” warping the original intent. Or did it? Suddenly, I’m confused. 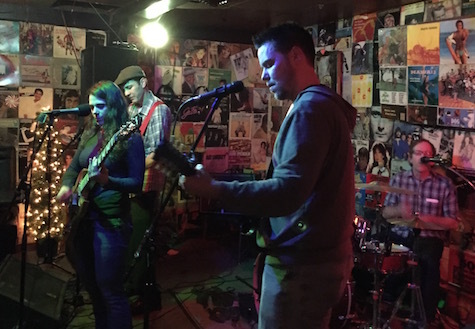 Well Aimed Arrows closed out Take Cover Five at O’Leaver’s Jan. 30, 2016. The night ended with Well Aimed Arrows covering Millions of Boys to an exhausted crowd. What should have been utter chaos — switching out a dozen bands over the course of four hours — came off swimmingly, and no doubt was another Hear Nebraska success. Rumor has it that many of the performances were recorded for Live At O’Leaver’s… Stay tuned. Apparently it’s going to snow tomorrow. This blizzard, which The Weather Channel has christened Kayla, could make attending tomorrow night’s gigantic ska show at Lookout Lounge challenging. But, hey, anything good is worth the fight, right? Your best bet is to follow The Lookout Lounge’s website and/or this Facebook invitation for the latest updates on the show.